Reverend Dodgson conducted the common service in front of the Queen, the Reverend Lords Griffin and Tuttle, Reverend Master Tlaloc, and an overflowing crowd. Alysseren had never seen the reverend so self-conscious—and she’d known him all her life. But as far as she could tell, aside from the occasional stammer, he recited the liturgy without any flaws. Of course, she should have been able to say precisely because she should have focused only on worshipful preparation for the High Service—as Fflwdw-llynwyn reminded her more than once. But though she tried, her attention drifted at times from the mystery of the Atoning Sacrifice to the splendid visitors arrayed behind the reverend, particularly the gallant young priest in the blue robe. Where could such a young priest have come from? All the other priests looked much older—though they never seemed to change. But this young priest was something new. Would he officiate in the High Service? Would he be the one who took her through the ceremony for the first time? Could she, perhaps, one day become a priestess and officiate with him? She blushed. What an inappropriate thing to think at a time like this. After the priests dedicated the church, the congregation came forward one by one for the Obeisance. They knelt before the Queen, the people offering their finest to adorn the church and the tochtin, bowing especially low, to receive their grey wafers. The Queen, regal and magnanimous, received and dispensed and dismissed each of them with her benediction. Shortly after Alysseren had presented herself and Fflwdw-llynwyn received his wafers, he paused midway through his second wafer, sat up, cocked his ears, and stared at the back corner of the chapel. She learned long ago that such behavior meant he was about to correct her. Indeed, he seemed entirely unaware of her. As Alysseren waited for Fflwdw-llynwyn’s trance to end, she became aware that the lights and colors weren’t as bright as they should be; the room was awash with distracting scents of drying paint, sweat, and wet fur; the organ bellows creaked and a fair number of people were off key during the closing chorus. Why hadn’t she noticed any of that before? She focused on the great gold and silver Cross of Atoning Sacrifice with its twined feathered serpents that hung gleaming above the Inner Sanctum. The screens below, which hid the Sanctum during the common service, were painted to show glory streaming down from the cross onto the faces of brown-robed supplicants approaching the Stepped Pyramid of Salvation. Reverend Dodgson had assured her only that morning, as he rushed her through the two month Catechism of the Initiates in less than an hour, that the High Service brought supplicants to a state of rapture. But as she looked now the faces on the screen seemed more resigned than joyous. Alysseren sighed and tried to shake off her peculiar mood. She had wanted to join the adults in the High Service for so long. Yet now, only moments away from being initiated into the mystery, why did she feel nervous instead of blissful? Perhaps it was simply that it had all happened so fast. The reverend had come last night, as she and Sister Alice were readying themselves for bed, to say she must be admitted to the High Service today. When Sister Alice protested that Alysseren needed the catechism and was looking forward to her coming-of-age party, Reverend Dodgson, rightly, pointed out that such things were secondary to the blessing of the High Service. As the last of the congregants filed from the chapel, Sister Alice pulled Alysseren aside and hugged her. “What if you have bad blood, child?” A tear coursed down Sister Alice’s cheek. Alysseren opened her mouth and furrowed her brows but couldn’t think of anything to say. Had Sister Alice, the very model of virtue and religious devotion, just told her to defy the church? Fflwdw-llynwyn was still distracted when the reverend finished latching the main doors of the nearly empty chapel. The three men who were to demonstrate the role of the supplicant to the initiates donned their brown robes, took an initiate by the hand, and led them to the priests behind the common altar. Alysseren’s pulse quickened when her guide stopped in front of Christopher Tlaloc. As the Reverend Master regarded her with a slight smile, she was suddenly conscious that, aside from the Queen, she was the only woman going through the High Service tonight. The organist began the Anthem of the High Service. Alysseren drew a deep breath. Why did such thoughts distract her? It was time to concentrate. She had spent her entire life—at least as much as she could remember of the last nearly sixteen years—helping Reverend Dodgson and Sister Alice bring people into the church of the Queen of Heaven so they could enjoy the blessing of the Atoning Sacrifice of the High Service. Now she was about to receive that blessing herself. Alysseren paused, surprised that Fflwdw-llynwyn would suggest such a thing—and at how much the thought appealed to her. She closed her eyes. It must simply be her nerves. When the anthem ended, the high priests opened the screens of the Inner Sanctum. Three mercy seats faced the pulpit beneath the great cross. Three golden grails rested on the table of the service in front of the pulpit. Unadorned crimson curtains covered the walls of the small room. “Is that all?” Alysseren whispered. The brown-robed men took their places behind the mercy seats. The initiates stepped to the left, where they could observe as their guides demonstrated the role of the supplicant in the ceremony. The Queen ascended to the pulpit while Reverend Lord Griffin closed the screens. “We stand guilty before thee,” the supplicants answered. The supplicants rose, sat on the mercy seats, and raised their right hands. Their tochtin pulled down their brown sleeves, exposing their arms. The supplicants laid their bare arms, palm up, on the arm rests of the mercy seats. Alysseren leaned forward: it was the moment of sacrifice, but she didn’t understand the significance of the posture. She would be a supplicant next and she didn’t want to make a mistake. The priests each retrieved a grail and what appeared to be a tiny golden trumpet from the service table. They chanted, “Between the falling and the rising, lies the blood,” as they placed the grails beneath the arms of the supplicants. The priests removed the sheaths from the needle end of the trumpets. “Not so tight,” Fflwdw-llynwyn gasped. Deftly, each priest inserted a golden needle into one of the forearm veins of each supplicant. Alysseren drew an involuntary breath. How could this be part of the High Service? How could needles in the arm have anything to do with blessings and rapture? Bright blood poured from the tiny trumpets into each grail. Sister Alice’s words echoed in her mind. Trembling, Alysseren closed her eyes and drew a deep breath to quell the nausea. Was this what Sister Alice wanted to tell her? The priests removed the trumpets, bandaged the arms of the supplicants, turned to the pulpit, and raised the grails to the Queen. A wave of boldness washed over Alysseren. She turned, flung aside the screens, sprinted across the chapel, and fumbled with the latch on the main doors. “Bring her back!” the Queen cried. Alysseren knocked Reverend Dodgson over when she burst out of the chapel. Others sprang aside as she fled through the foyer. She flew down the front steps and vaulted over the great stone feathered serpent on the right. She hitched up her white robe as she ran around the church. Fflwdw-llynwyn helped her slide her arms free and shed the robe before she sprinted under the airship, avoiding the electric lights shining from the gondola. With her skirt gathered, she careened down the slope of the sheep field, heading for the forest beyond. The full moon peeked over the eastern mountains, but it didn’t help among the trees. Fflwdw-llynwyn, however, seemed to know exactly where to go. Alysseren was happy simply to run, as long as it was away from the church. “Who?” Alysseren asked between breaths. Alysseren was quite out of breath when she tripped. She rolled instinctively to cradle Fflwdw-llynwyn but felt him flying away instead. Suddenly separated, she was barely aware of her surroundings until she blundered into a massive iron leg. A metal tentacle wrapped around her and lifted her above the trees. Gears ground together as the riveted iron shell, stark in the moonlight, swung toward her and brought its guns to bear. It was a war machine. The Alyscrai is available in both Kindle and trade paperback editions. Alysseren, her hair spreading like dark fire over her snowy robes, stood with the other initiates at the head of the throng gathered around the broad sheep field below the newly finished church at New Harmony to await the coming of the Queen of Heaven. Golden light bathed her upturned face as she watched the Ship of Heaven descend through the late afternoon sky. She shivered when the braking breeze from the airship’s great propellers washed over her and hoped she could remember everything she had to do to get through the initiation. One of the boys from the village was trying to catch her eye as he and his fellows helped the deacons catch the handling lines and guide the Ship of Heaven to the mooring lock atop the steeple. He seemed taller than she remembered and she quite liked the way he smiled at her. “We live by faith,” Alysseren murmured as she watched the lovely young men securing the gangway below the gondola. There were so many to choose from. Perhaps it was best for the church to decide. Behind her, Reverend Dodgson was quietly assuring someone that rumors about a war machine lurking in the woods and stealing tochtin were baseless, and that a self-propelled metal tower bristling with guns and tentacles was the stuff of nonsense. The Queen’s Own Guard, dashing as always in their crisp uniforms of red and black, filed out of the airship and took up their stations. A priest in gold-trimmed robes of blue was the first to descend. Alysseren gasped. He was young—not even twenty—and tall, with what appeared to be broad shoulders beneath his robe. His hair was thick and sculpted, like the manes of the feathered serpents that flanked the entrance to the church. His eyes and brows, showing the marks of a keen intellect, were set in light, unblemished skin above a mouth accustomed to smiling. “Handsome?” Fflwdw-llynwyn fluttered his lashes. “And I shall always love you,” he purred. The world around her seemed to brighten and she heard the evening birdsong above the murmur of the crowd. She felt so thoroughly serene that she didn’t flinch when Reverend Lord Tuttle, a purple-robed mountain of a man with a puffed, pallid face, shuffled down the gangway. Surely he had forgotten about her youthful zeal nearly three years ago at the last dedication. After all, that was the day one of the congregation was found to have bad blood and had to be executed. The second high priest, as trim and precise in his purple robe as his peer was over-abundant, joined the other two priests in the field below the gondola. He surveyed the congregation, the deacons who held them back, and the perimeter of guardsmen. Then he signaled Reverend Dodgson. The children’s choir sang a song of welcome. An electric thrill ran up Alysseren’s spine and her pulse quickened as the supreme and most holy leader of the church, whom she had known, until this moment, only from paintings, glided down the gangway. The Queen of Heaven, Corazón Hernandez de la Sangre Sagrada, was resplendent in robes of the richest crimson, trimmed with real cloth-of-gold and embellished with an encircling world-serpent, wrought of precious stones, in whose scales icons of all twelve angels appeared. Her face—porcelain-white with full lips that matched the color of her robes—was framed by the iridescent feathered serpents, whose jade tails were lost in the Queen’s raven-black hair, that twined around the magnificent cross of gold and rubies surmounting the sacred headdress. Alysseren blinked. How curious: the Queen looked exactly like the hundred-year-old painting of her that the reverend had gone to such trouble to procure for the foyer of the new church. The choir sang the final amen. As the Queen mounted the podium, Alysseren realized she had been staring at the sapphire image of Tlaloc, the Rain Angel, on the Queen’s robes and that the other initiates were already kneeling. Reverend Dodgson glared at her as she dropped to the ground. The people shouted, “Amen!” three times as the Queen, her priests, and the escorting guardsmen paraded toward the church. Alysseren lifted her head. The paintings fell short of capturing the beauty of the Queen’s face—or the cold power in her brown eyes. The Reverend Lord Griffin regarded Alysseren for a moment and then nodded once. Alysseren’s smile dissolved as her jaw grew slack. There was something in the Queen’s tone that made her feel no better than one of the sheep that had been cleared from the field this morning. With a swirl of crimson robes, the Queen strode away to lead the procession into the chapel. Alysseren hurried to rise: the initiates were to follow the priests. But she stepped on her robe and tripped. Arms outstretched, she landed heavily on the gravel. Fflwdw-llynwyn barely managed to cling to her robes. An instant later, strong, gentle hands lifted her back to her feet. Alysseren found herself in the arms of the blue-robed priest. A shiver raced up her spine as she looked up into his smiling face. It was the first time a man had held her so close. Blood welled from her punctured palm. “Allow me,” said the young priest, his voice a rich baritone. Supporting her with one arm, he took her wounded hand and kissed it. When he raised his head, the blood was gone. A wave, warm and exciting, traveled up her arm. Before Alysseren could manage a reply, he had tied his handkerchief over her wound and helped her to her place in the procession. “I, ah … that is, who shall I say came to my aid?” Alysseren asked as they entered the chapel. The thought of being so wicked had been thrilling, almost intoxicating. The reality was uncomfortable and dull. It had been easy enough for Alysseren to slip under the pews at the end of the common service while everyone else was busy. Sister Alice had gone to the vestry to prepare for the High Service. Reverend Dodgson was tripping over himself attending to the high priest who had come to dedicate the new church. That was fifteen minutes ago—fifteen minutes of trying to stay perfectly still while curled up on the hard wooden floor—and they still hadn’t started the anthem yet. Insofar as she could tell from beneath the pew in the middle of the chapel, the adults were simply milling about. Hiding to see the Inner Sanctum and watch the High Service no longer seemed like such a good idea. He yawned, exposing his cat-like teeth, and stretched in her arms till his furry toes touched her thigh and his delicate hands reached past her head. The floor vibrated with the heavy footfalls of someone crossing the chapel. “Hush,” Alysseren whispered. She held her breath until the dust settled. At least the dusky, just-rained smell of the new wood floor didn’t bother her. “Sometimes I think you want me to get caught,” she said. The bellows creaked for a moment and then the organ sounded the opening chords of the Anthem of the High Service. Alysseren rolled onto her elbows. Her tochtin climbed to her back. She couldn’t crawl, thanks to her skirt, but she could pull herself under the pews. They reached the second row as the anthem ended. Most of her view was filled with the brown robes of the people about to go through the High Service. No one, however, stood directly ahead and she could see the ornate screens behind the altar that hid the Inner Sanctum. Alysseren drew a quick breath and a shiver spread across her back when someone opened the screens and she caught a glimpse of the red curtains in the Sanctum. A rough hand pinched her ear and hair, and pulled her to her feet. Her tochtin cowered in the crook of her arm. “Hold, Dodgson,” the high priest shuffling toward them said. He was the fattest man Alysseren had ever seen. In the robes of a Reverend Lord, he looked like a great purple turtle—and she almost said so. Sister Alice stepped from among the other brown-robed supplicants and nodded. Alysseren couldn’t bear to look at her sad eyes. Alysseren managed to hold back her tears, even though her ear throbbed in the reverend’s grip, until they were out of the chapel. Alysseren had never seen the reverend so flustered. He slammed and locked the door. Alysseren sank into a corner among the toys, buried her face in the white and brown fur of her tochtin, and sobbed. “Don’t be sad, dearest,” her tochtin said as he caressed her hair with his tiny fingers. The tochtin rubbed against her cheeks and dried her tears with his fur. 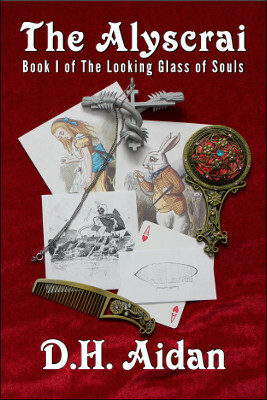 He leaned from her lap, collected letter blocks from among the scattered toys, and arranged them to spell F-f-l-w-d-w and l-l-y-n-w-y-n.
Dunlith Hill is pleased to announce that D.H. Aidan's The Alyscrai, Book I of The Looking Glass of Souls, is now available. In the California of an alternate 1898, Alysseren, a sixteen-year-old missionary, matches people with tochtin—lemur-like familiars who convert their hosts to the church of the Queen of Heaven. When she is admitted to the adult congregation, the bloody secret of the High Service shakes her faith. At the same time, she meets two intriguing young men who vie for her favor—the handsome priest assigned to prepare her for the next High Service and a dashing Mayan amnesiac—and uncovers a conspiracy among the tochtin to use their human hosts as weapons against the Queen. Determined to save both the tochtin and the people they control, Alysseren navigates both a land infested with towering, steam-powered war machines and the attentions of her new companions as she tries to stop the rebellion. But every step leads inexorably to a collision with the Queen, and a terrible choice: sacrifice her beloved tochtin ... or herself. The ease with which an e-book may be revised and released is one of the powerful features of the new electronic publishing platforms. Surviving the Writing Life, the first Dunlith Hill Writers Guide, provides an introduction to the series. 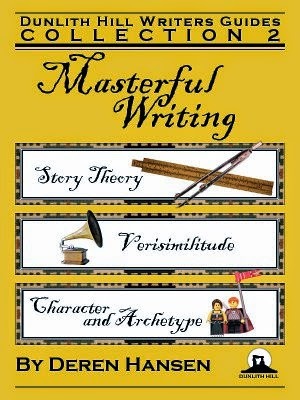 The framework it offers for understanding your motivations and expectations as a writer is among the most important insights available in the guides. 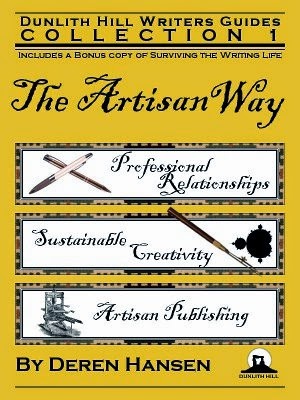 While revising the guides in preparation for the release of Artisan Publishing and the collected volumes, I realized that Surviving the Writing Life could do a far better job introducing the series if it’s price were reduced and it included the first chapter of every other writers guide in a sampler section following the main text. 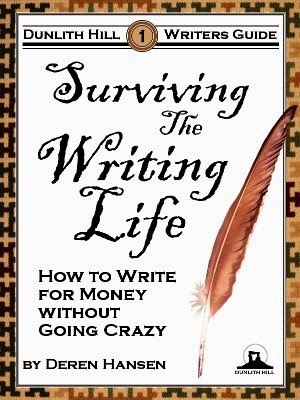 I’m pleased to announce that Surviving the Writing Life is now available for $.99 (and free at Kobo). Deren Hansen is the author of the Dunlith Hill Writers Guides. The Dunlith Hill Writers Guides were originally conceived as a series of concise e-books, each focused on a single topic. As I developed the guides, it became clear that some of the e-books belonged together. In conjunction with the release of Artisan Publishing and refreshed editions of the other guides, I’m pleased to announce that the Dunlith Hill Writers Guides are now also available in two collected volumes. In addition to an e-book bundle (which is more economical than purchasing the guides individually), the Dunlith Hill Writers Guides Collections are also available in trade paperback editions. “May you live in interesting times,” is an old Chinese curse, and sounds tame, as curses go, compared to ones that call down withering diseases, plagues of vermin, and the wrath of the undead. Its beauty, however, is that it looks innocuous, but packs a wallop: unlike the gruesome specificity of the typical curses interesting times could mean anything. Regardless of the cause, times become interesting when old certainties no longer hold and no one knows what to do. Publishing is now in the midst of interesting times. For a substantial portion of the last century and most of the first decade of this one, the publishing industry has been defined by the logistics of distributing books to bookstores. There were innovations, like mass-market paperbacks and book stands in supermarkets and big-box retailers, but none of these changed the fundamental distribution pattern. Setting yourself up as a publisher required a second-mortgage-level investment to print books and a tremendous amount of legwork to arrange for distribution. The advent of electronic publishing changed everything because the barrier to entry dropped to little more than the time and effort required to write the book. What we used to call publishing (or commercial publishing if we needed to distinguish the standard model, where authors were paid by publishers, from vanity publishing, where authors paid publishers) now gets qualified with words like, traditional, legacy, or even, dinosaur. And now we talk about self-publishing and independent or indie publishing (an attempt to align with the success and credibility of independently produced films and music), and even argue that trading a 70% royalty for a 15% royalty and recognition by a publisher is a new kind of vanity publishing. But there’s something happening in the market that is far more important than the tug-of-war between dependent and independent publishing models. GLA: You’ve been agenting for almost 10 years now. You’ve got a great perspective on the industry. What do writers need to know about being a writer nowadays that perhaps was not a concern a decade ago? It’s easy to hear that, “It’s extremely difficult to sell a quiet, well-written book,” shake our heads knowingly, and grumble about publishing following in the footsteps other entertainment industries that focus on blockbusters. Regel’s comment, however, is evidence of a fundamental structural change rumbling, like shifting tectonic plates, through the industry. In 1997, Clayton Christensen published, The Innovator’s Dilemma: When New Technologies Cause Great Firms to Fail,  in which he explored the generational pattern where once dominant firms are eventually eclipsed by more nimble startups that, in turn, become dominant. According to common wisdom, the old firms became dinosaurs for whom the meteor couldn’t come too soon because their management failed to keep up with changing technology. Christensen’s research uncovered something far stranger: the firms that failed were generally well managed—listening to their customers, investing in research and development, and aggressively marketing their innovations—and yet none of that staved off their eventual demise. The problem, though, is structural. Christensen showed how, across many industries, companies consistently migrate to the high end of the market where their products enjoy the greatest profit margin. In doing so, they often abandon the low end to new firms with new technology. The key piece in the puzzle that Christensen brought to light was the fact that established firms could rationally abandon the low end of the market because the new technology was so obviously inferior to the older technology the established firms controlled. For example, the manufacturers of 5.25 inch hard drives had nothing to worry about when 3.5 inch hard drives were introduced because the smaller disks were slower and held less data: they were only good for laptops, where space was at a premium. But things tend to get better over time, and in a few years the smaller hard drives were good enough that computer manufacturers standardized on them for both laptop and desktop systems, and suddenly the market for 5.25 inch hard drives evaporated. The disappearance of mid-list books from agents’ radar is clear evidence of publishers moving toward the high end of the book market and abandoning the low end: it’s no longer worth the time or effort to bring a quiet, mid-list book to market when what publishers really need is a string of bestsellers. E-books and online markets provide an inferior, but cheaper reading experience. It’s a textbook example of disruptive innovation. Of course, printed books and the established firms that produce them are not going to go away—at least not anytime soon. Books will continue to be available in a vibrant mix of print and electronic formats. But it’s not hard to imagine a time when printed books, like vinyl records, are only sought out by true aficionados. The way in which the forces at work in the market for books will ultimately play out is much less important than the fact that established firms are moving toward the high-end of the market, creating space at the low end for smaller, newer firms and even for artisans. That would be enough to qualify as interesting times, but there is another, equally fundamental, structural shift at work in the market. I stopped going to first-run movies a long time ago. I made that decision during the era of local video-rental stores. The fact that I would eventually be able to see the movie, at a cost that was easier to bear on my starving-student budget, took the wind of urgency out of my movie-watching sails. Now, the same thing has happened with books. There’s more to the analogy between book-buying and movie-going: both industries do their best business with blockbuster releases because they create value by creating artificial scarcity. Being among the first to see a much anticipated movie or read a major author’s latest release gives short term benefits, above and beyond the value of the story, like bragging rights. Libraries, the antithesis of theaters and bookstores, are fundamentally about lasting value—not in terms of absolute worth but in the much simpler sense of something in which people continue to find value over time. The challenge for authors and publishers in the brave new electronic world will be to create lasting value that attracts an ever growing audience instead of relying on scarcity to create a bubble of demand around the release. The opening of the literary market and the end of artificial scarcity have together created an opportunity for a new kind of publisher: an artisan publisher. The word, artisan, long carried the sense of the common practitioner, as opposed to the artist who brought genius and inspiration to the work. But as mass production blesses us with a collective and mostly uniform affluence, artisan has come to signify a means of production where low unit cost and economies of scale are not the primary objective. Artisan bread, for example, is made by hand even though there are bread factories that can out-produce an army of bakers. Why, if we are rational economic actors, would we ever choose a product that is more expensive and less available than a mass-produced equivalent? People who prefer artisan breads may argue in terms of the varieties or flavors available nowhere else, or the virtue of supporting local production, but for most people it simply tastes better. Small production batches and traditional, hand-made methods allow skilled craftspeople to invest love, care, and attention to detail to insure the integrity of their work. 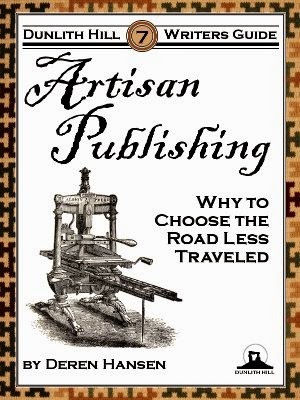 Artisan publishing isn’t simply a variation on the theme of doing it yourself. The large, well-stocked home improvement centers dotting our suburban landscape owe their existence more to naivety, false economy, and hubris than to a genuine and supportable conviction that doing it yourself is the best way to get the job done well, right, and in a timely fashion. The path of an artisan publisher begins with having something worth saying and a thorough effort to determine the best way to publish that work. As with our writing, where no character, scene, or sentence is too precious to escape scrutiny, artisan publishing has nothing to do with shortcuts or showing the gatekeepers how wrong they were about your manuscript and everything to do with what is best and right for the project. One of the most important lessons every skilled craftsperson must learn is just because you can doesn’t mean you should. The greatest works of art are exercises in restraint not excess. Artisan publishing is a patient, laborious path. It’s not enough to have the skill, the aptitude, or even the inclination to publish your own material. You need to know why, both for your particular project and for you as an individual, the way of the artisan is worth all the time and trouble it will cost you. A journey of a thousand miles may well begin with a single step, but your chances of completing the roughly two million steps that comprise the journey are poor if you don’t know why you’re doing it. There are many bad reasons—one of the worst being because everyone else is doing it—and only a few good ones. The difference is that bad reasons wear away over time but good ones will see you through to the end. No true craftsperson undertakes a work lightly—not because their work has mystical significance but because the hallmark of skill is to act deliberately. In order to act deliberately you need to know why you’re acting: you need to have a sense of your mission as an artisan publisher. Otherwise, you’ll provide yet another confirmation of the old aphorism that if you’re aiming at nothing you’ll hit it. There are already too many books promising to give you the insider secrets that will enable you to make a fortune in electronic publishing—how to format and upload text, create covers, and build a readership with free, or cheap books, and paid reviews that will make your e-books fly off the virtual shelves. This guide covers none of that: it’s not a how-to, it’s a why-to. It’s a guide to the context, philosophy, and expectations you should have if you want to be an artisan publisher. Chapter 2 sets the groundwork with a clear view of the publishing industry. You need to understand what commercial publishers actually do and the roles of author and publisher if you want to participate intelligently. Chapter 3 takes a sober look at the reasons you shouldn’t choose artisan publishing. Having laid that groundwork, Chapter 4 explores the advantages of being an artisan publisher, the biggest of which, editorial control, is covered in Chapter 5. Chapter 6 turns to the challenges you’ll likely face as an artisan publisher. Managing time and your expectations about time is enough of a challenge, in its own right, that it is the subject of Chapter 7. Chapter 8 outlines aspects of the craft of publishing you will need to master. The artisan philosophy of business and marketing are covered in chapters 9 and 10, respectively. Chapter 11 reveals the illusion of a national book culture that holds back many potential artisans. Chapter 12 explores strategic publishing in an age of abundance (what some have called the problem of discoverability). And Chapter 13 steps back to put the entire discussion into perspective. The electronic frontier is neither literary heaven nor hell. It’s simply a new set of opportunities for readers and writers. It’s not a religion that requires you to renounce other forms of publishing. Rational authors, acting in their best business interests and in light of their particular circumstances, will find good reasons to take advantage of all the different publishing options at various times and places. The barriers to entry are low enough that you will likely find reasons to participate, but don’t confuse the ease with which you can publish with lower standards. In this new age of digital abundance, the one thing that matters—which is the only thing that has ever mattered—is writing a good book.